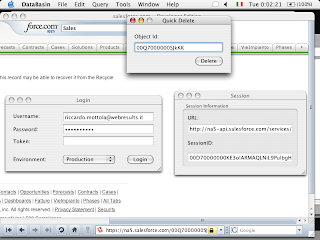 I implemented delete in the Salesforce.com API Layer (DBSoap) of DataBasin. The screenshot shows DataBasin running on the Mac, natively built in Xcode. Delete is capable of deleting an array of records, on top of this I implemented a convenient function: QuickDelete. Just enter a Saleforce.com ID and delete it. Full handling of the error results is still missing, currently only the verbose message are retrieved. For the QuickDelete an error gets conveniently displayed as if it were an exception in a small scrollable panel. 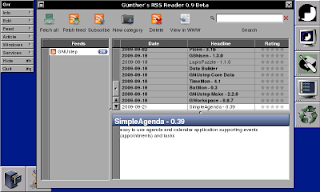 Guenther Noack, the Author of Grr, donated the appreciated RSS Reader and its Framework RSSKit to the GNUstep Application Project some time ago, since he had no time to maintain it any more. I will not promise anything, but as it is usual for GAP projects we try hard to make our programs compatible. Thus Grr got a general make up of crash fixes, makefile fixes and warning fixes. Then an extensive work of removing forward declaration of Protocols was done so that compilation on gcc 29.5 is now possible, expanding the list of platforms where to run Grr on. I compiled and ported Grr to the MIPS based Letux 400 netbook as can be seen in the screenshot. Grr uns perfectly and thus tracking RSS on the small device is now smooth as butter. RSS everywhere with you!